Equipped with a meditation room for scientific research and a brain-imaging lab, researchers at the University of Wisconsin–Madison examined, for the first time, whether we can be trained to be more compassionate within a short amount of time, leading to more altruistic behavior and related changes in our neural systems. “The theory is that if you practice compassion through meditation, practicing in your own mind, then this will actually translate into when you see someone suffering or in need,” Helen Weng, a graduate student in clinical psychology and lead author of the paper, said in telephone interview. The new study, titled “Compassion Training Alters Altruism and Neural Responses to Suffering,” was published in the journal Psychological Science. Using functional magnetic resonance imaging (fMRI), the researchers measured how much brain activity had changed between the beginning and the end of the training. They found that “the people who were the most altruistic after compassion training were the ones who showed the most brain changes when viewing human suffering,” according to a press release. 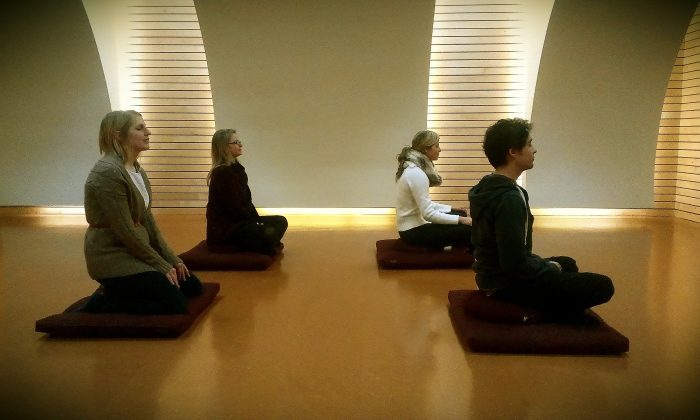 At the Center for Investigating Healthy Minds, nestled near the southern shore of Lake Mendota and clustered near hospitals, medical research and health science centers on UW-Madison campus streets, researchers taught participants how to meditate. For two weeks, participants meditated and practiced generating compassionate feelings towards three different kinds of people in their lives. At home, the participants listened to guided-audio instructions over the Internet for 30 minutes per day during the two-week study. There was also a control group who practiced cognitive reappraisal, which is “a technique where people learn to reframe their thoughts to feel less negative,” according to the press release. Back at the center, researchers then measured emotional responses in the brain scanner as participants meditated. Next came the real test. Unbeknown to the participants, they were being tested on altruism and how likely they would help a stranger in need. “We didn’t want them to know that we were measuring altruistic behavior and we told them it was a separate study,” Weng said. The study participants basically played the role of a bystander and watched two anonymous players in the “Redistribution Game” exchange money over the Internet. There was a “Dictator” and a “Victim” in the game. The dictator had $10 and the victim had nothing. Meanwhile, the participants had $5, so they could help the victim within the circumstances if they wanted to. For every dollar the participant gave to the victim, it would take away $2 from the dictator and give it to the victim. The results showed that the compassion-training participants were more likely to help out a stranger versus the participants in the control group. The hypothesis is that compassionate meditation actually increases altruistic behavior, according to Weng. “Then we wanted to know: Well, how are their brains changing in response to people suffering?” she said. They examined the brain activity data and saw that the more the brain changed after two weeks of compassion training, the more money the participant ended up giving to the stranger. Researchers found these brain changes in the inferior parietal cortex, a region associated with empathy and understanding others. “Compassion training also increased activity in the dorsolateral prefrontal cortex and the extent to which it communicated with the nucleus accumbens, brain regions involved in emotion regulation and positive emotions,” stated the press release. “They were learning a more affiliative, a more kind and warm approach to these people who are suffering,” according to Weng. But practicing compassion on a computer screen is different from practicing compassion in real life. After the study, the researchers asked participants if they noticed any changes in their everyday lives. “One person said things like they were at the grocery [store] and they were more kind to the person who is checking them out at the grocery store” and “a little more patient when they have to wait in the grocery store line,” Weng noted. They also recorded how the participants were feeling during the study. For some participants, it was easy to feel compassion for someone they really love because they already felt connected to that person. “It’s kind of like weight training … we found that people can actually build up their compassion ‘muscle’ and respond to others’ suffering with care and a desire to help,” Weng said in the press release. She explained during the telephone interview that compassion could be developed like a ‘muscle’ because it’s an ability we already have inside us, waiting to be used. For example, Weng said that children are naturally born with a system to connect with others and love, because they need to in order to survive. Dr. Richard J. Davidson, a renowned neuroscientist and pioneer in studying the impact of meditation on the brain, founded the Center for Investing Healthy Minds in 2008, where researchers conduct “rigorous scientific research on healthy qualities of mind such as kindness, compassion, forgiveness and mindfulness,” according to its website. Alison DeShaw Rowe, a public relations specialist for the center, said that Dr. Davidson decided to put compassion on the scientific map and study it from a scientific standpoint after the Dali Lama asked him a question in the early 1990s. He was asked, why do psychologists only focus on negative emotions like anxiety and depression? “Why don’t you all apply these tools in studying healthy qualities of mind?” DeShaw Rowe said. Weng noted that other studies on compassion have shown that people tend to have a less stressful response while being evaluated, more positive emotions day-to-day, greater life satisfaction, and less depression. “It makes you connect with people, whether at work you are more friendly, or more willing to try new things,” Weng said, continuing that she is interested in studying how compassion changes our interaction with our own family and friends. “I think that it can show people—it might be a little less about what do I need all the time, but what do other people need,” Weng said, adding that in doing that you are actually helping yourself as well.